Still the cutest racecar driver's wife I've ever seen. I'd of liked to have seen her husband actually win this race at least once. They both always seemed like such nice people when interviewed on tv, and I like that they're still married today in an era where it almost seems like it's the norm to trade in your spouse as frequently as you do your vehicle. I helped a friend of mine feel better yesterday. He just needed someone to talk to, and though I was more than a few days late, I tried to be there for him and gave my best attempt at giving him some advice. I was never able to help someone in my entire life, so it feels really nice. 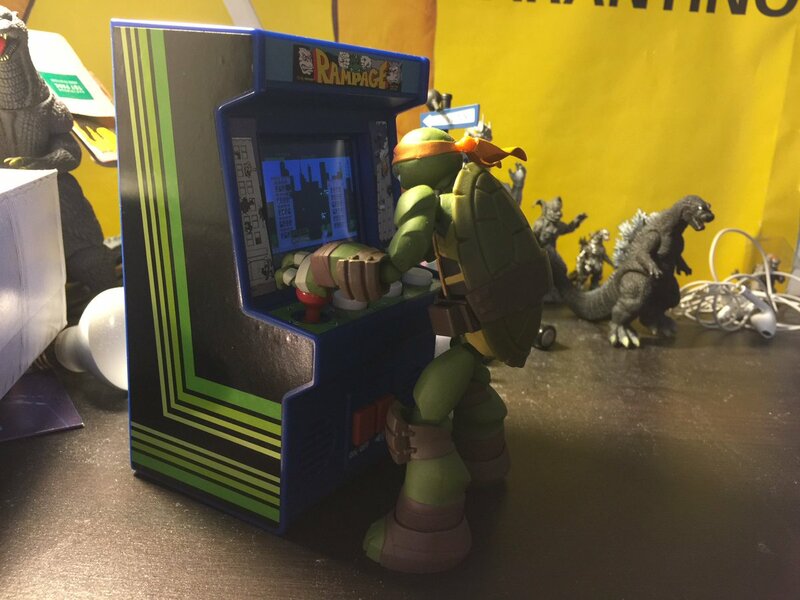 Remember how I was sad I can't find Rampage the mini arcade thing? Well on a whim I decided to go back to the Wal-Mart where I got Oregon Trail, to see if they put in new stock. Lo and behold, I saw ONE!!!!! I was going to save my money after buying fancy turtles, but I just had to have this. And look! The fancy turtles FIT!!! Very cute. But Godzilla doesn't get to play? Is that a King Caesar? The Godzillas I have are too small or too big to fit properly, and yes, that's King Caesar. So I played a lot of Rampage last night mew, and I put it on pause since there's no save, and in the morning the batteries died. I dunno if it's 'cause the batteries included are so crappy (which they are) that they didn't last long, or if the game just dies quickly due to design? I put in 3 better batteries. Should I try it again tonight and potentially squander these batteries? My guess is that the battery life is probably only 6-8 hours (going by the battery length on my Atari Flashback portable*) and that pause doesn't put it into an energy saving mode. The poltergeist or faeries or whatever that was haunting me is back! I lost a pair of glasses about a week ago. They fell out of my work slacks. I was too lazy to look for them until tonight. I went to where I keep them (hang them on a kitchen table chair) and looked all over for them on the floor by the kitchen table for about 15 minutes. No glasses. So I shrugged, they only cost a $1. Then I just went back into the kitchen. They were laying on the floor in plain sight. They were not there earlier. I have been in and out of the kitchen 3-4 times since I looked and they were not there earlier (I would have stepped on them). Also, BOOYAKASHA!!! 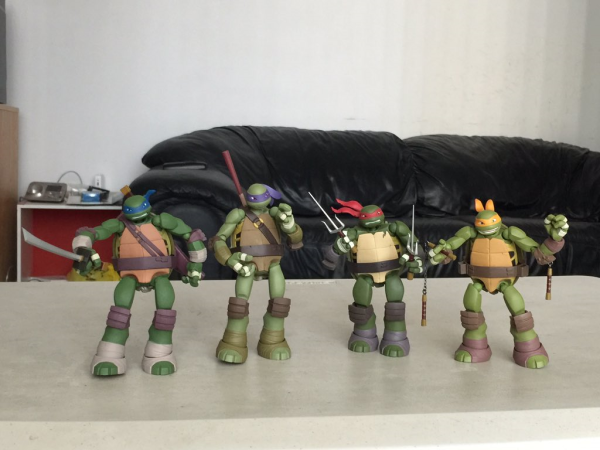 My fancy turtles finally shipped!!! It's time for a victory dance! Can you post animated GIFs in here? I forget mewmew. 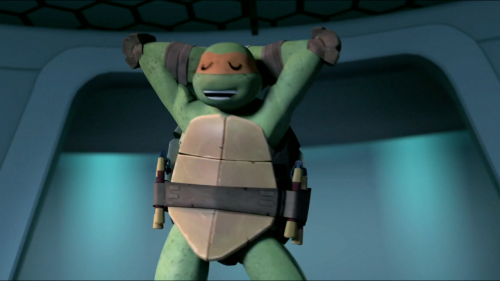 Oh, the turtles are now flying in the air!! On another note, I haven't had a turtle dream for a bit now. I guess they finally had enough and left me. I don't even get cameos anymore. Maybe you do, but you just don't remember them? I've owned it on 360 for a couple of years, but I like having something like this accessible on as many systems as possible, when financially within reason. Some states are now charging tax for digital goods, so it looks like your state is one of the 'victims.' If you don't live in the states, then ignore everything I just said. No mew. 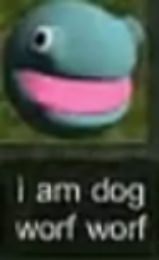 While I may forget dreams, I ALWAYS remember dreams that has any copyrighted stuff (characters) in it. 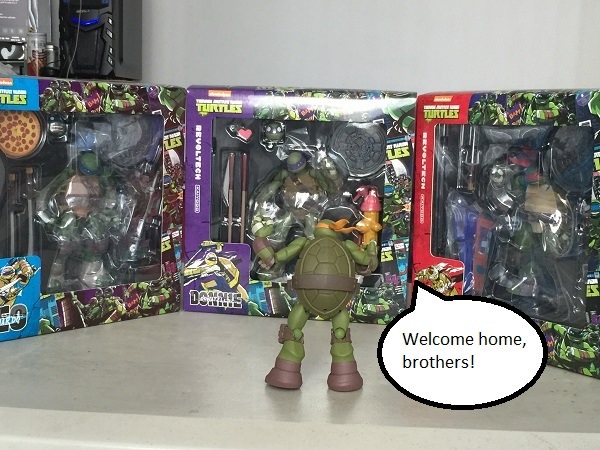 My turtle bros are now in Canada since 8:45am!! It passed customs in 9 minutes!! Hopefully I didn't get dinged with customs fees. I already paid close to 300 for you guys! They are my most expensive figures ever! I liked him on F-Troop. Never really watched Mama's Family and I barely remember Mayberry RFD (Although I'd like to track down the first episode to see Andy and Helen get married). I never heard of him. There are a ton of people I dunno about. 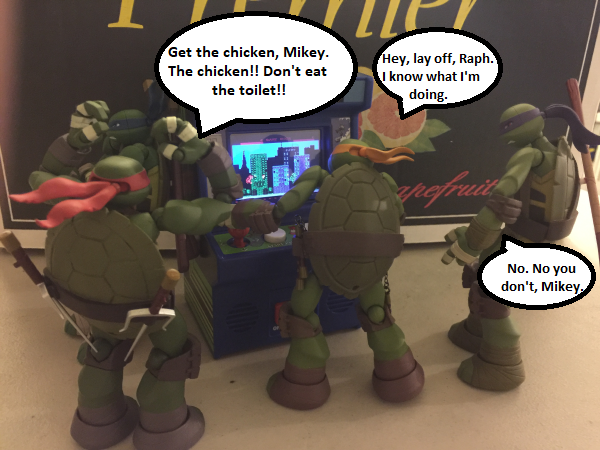 I have a bunch of digital '12 Turtle comics (on mobile) and I am currently busy screen shotting the pages and backing them up to PC in case anything happens to them; company dies and all the comics get removed, or I no longer have a phone, etc. It also means that I could, if I wanted to, send them to other people to read. Who runs the Twitter account for the site? I did my once in a blue moon sign in on Twitter today, and saw notifications that the Twitter account for here was now following such and such. Just made me curious who was still logging into the site's Twitter. I wonder why this isn't on Blu-Ray. All things considered, it looks pretty good. Was my first DVD I ever owned. Hadn't paid attention to DVD until getting this for Christmas back in about 2004. I never had any idea who ran the twitter account, even when the site was alive. Oh I've heard of Fantasy Island. My turtles are now heading to the post office. Most likely will get them tomorrow. I could never get past the introduction to Fantasy Island. It was a strange show, but I enjoyed it. Sort of like The Love Boat meets the Twilight Zone. 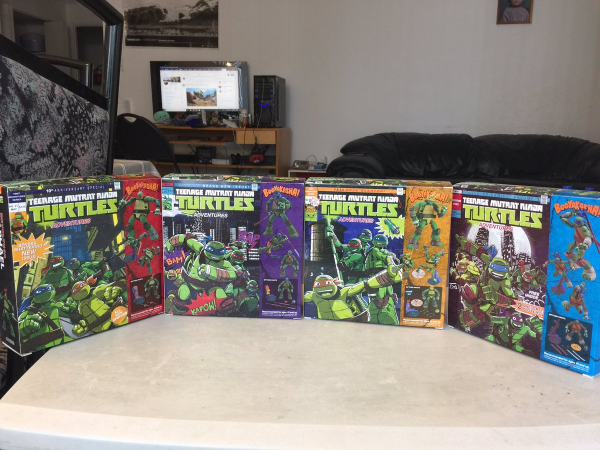 My turtles came!!!! They are awesome sauce! 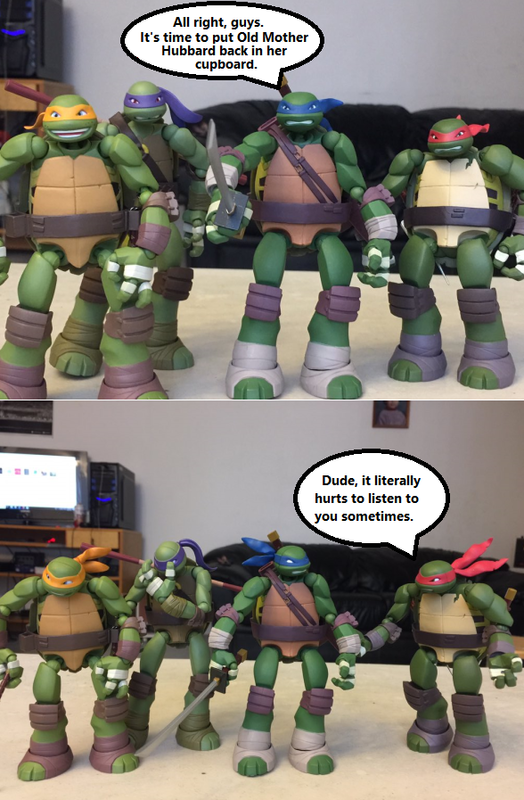 Now Mikey will no longer be lonely. There's a different scene at the back. I posted this on Twitter and got 17 Likes! It's a recreation of a scene from The Alien Agenda.